New! You can charge your electrica car here for free! You will stay in individually decorated rooms, in the farm house dating from the year of 1787 with furniture typical from that era. 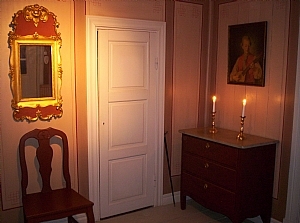 From April to October, you can also choose to stay in our newly renovated farm hand’s house, from the middle of the 18th century, the house was renovated together with Östergötland’s county museum. Belonging to the farm hand’s house is, of course, an outdoor WC, but shower and an indoor WC is available in the farm house next door. Enjoy a real country breakfast in the dining room and let the children connect with our lambs and the tame sheep Oskar. At the farm there are also sheep, cats and breeding of Swedish Warmblood horses (SWB). Our small farm shop is opening in the summer and offers small things for your home, bric-a-brac and handicrafts from Östergötland. We are open from June to August along with weekends. Other times by agreement. If you need space for your horse, we can offer you stalls and pastureland during the summer. From road E4: Take off towards Söderköping, road 210. Circa 5km after Västra Husby, sign on your right "Thorstorps Gård." From Road E22: Drive to Söderköping. Take off towards Linköping, road 210, drive 2.5km, sign on your left hand side "Thorstorps Gård". Play golf at Söderköping´s Golfs beautiful 27-hole course, scenically situated by the Göta Kanal. The course is situated about 5 minutes by car from Thorstorp’s Farm. Breakfast SEK 75 SEK per person. Feel free to bring your private bed linen, but it is also possible to rent. 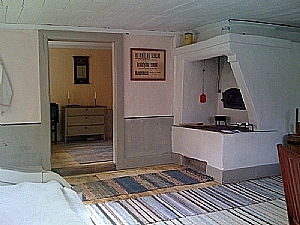 The farm hand’s house consists of a room and a “kitchen” with microwave, fridge and coffee perculator, but there are no cooking facilities. The house is circa 40m2 and has room for up to six berths. TV. Newly renovated outside WC! Shower and inside WC available in the farm house next door. If you book three nights or more, payment must be received in advance. in the event of cancellation at 14 to 3 days before booked arrival date, a cancellation fee of SEK 500 will be charged. Cancellation at 3 days or less before arrival date, the entire cost will be charged. If we are able to rent the room out, a part of this cost will be reduced. Please note! Now we accept credit cards!.